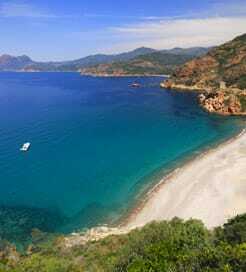 Corsica is a French island situated in the Mediterranean Sea and is known for its beautiful coastline of more than two hundred beaches. With its position in the North of the Mediterranean, getting to Corsica by ferry is quick and easy and whether you choose to sail from France or Italy, there’s a huge selection of ferry routes to choose from with ports in each corner of the island. Departures from France are available from the ports of Toulon, Nice and Marseille. Crossings operate daily, year round, and increase with demand around peak season. Crossings from Italy depart the ports of Savona and Genoa in the north and Livorno and Piombino on the west coast of Italy. As with the crossings from France, due to Corsica’s popularity as a destination, there are year round connections to the island, increasing during the summer period. In additions, there is also a ferry crossing bridging the short gap to Sardinia, south of Corsica. The majority of ferry passengers arrive by car, though vehicles can be rented from most port towns. The island has a well-connected road network which will allow you to take any one of the number of smooth roads along the coastline to reach the stunning beaches and sheltered coves, getting off the tourist track. Impossible to miss during your visit are the sandy beaches with their crystal clear waters. Many of the beaches offer a range of activities like volley ball, surfing, yachting, canoeing, skiing, banana boat rides, fishing and more. "Route from Civitavecchia to Olbia"
The ship was a beautiful experience for my daughter and me. The long route was enjoyable because of the outlook of the ship. It's great to sit in the lounge or outside either. The only problem was there was nothing to eat apart from sandwiches and toasts because the Pizzeria wasn't open. I have to mention the journey was 6 hours instead of the official 5 from Civitavecchia to Olbia. We didn't really mind. From booking online, to boarding the ferry- all so very easy and all in all a great experience. The four hour crossing from Livorno to Bastia was most pleasant and with our flexibility with dates we were able to travel on Thursdays which proved much cheaper than Saturdays. I believe we received good value for money! For more information, please visit our Ferries from Italy to Corsica page. 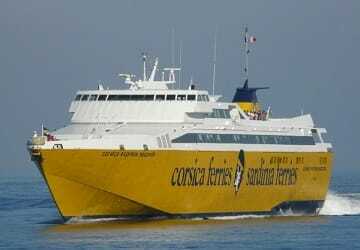 For more information, please visit our Ferries from Sardinia to Corsica page. For more information, please visit our Ferries from Elba to Corsica page.